The Travel Coffee Filter Revolution is about you! It’s about you being able to have your cup of coffee anywhere, anytime. FLTRgo gives you that freedom. Everyone is Welcome (Even Tea Drinkers). Originally, FLTRgo was designed for people on the move, people who carry their life on their back or in their luggage. It had to be lightweight. It had to be compact. It had to be reusable. It had to be simple to use, easy to clean, and rugged enough to outlast the rigors of life on the road. And of course, it had to make a great cup of coffee. But, we soon discovered that the Travel Coffee Filter Revolution was much bigger than we had dreamed. We caught the eye of environmentally-minded, zero-waste community as an alternative to paper filters. Survivalists and bushcraft enthusiasts found the FLTRgo a ready addition to their arsenal. Minimalists, tiny-home owners, van-life adventurers, dorm-room dwellers and good folks in mobile homes loved how little space the FLTRgo took up in their alternative abodes. Of course, the tea drinkers quickly and vocally made sure that they were not left out of the revolution. 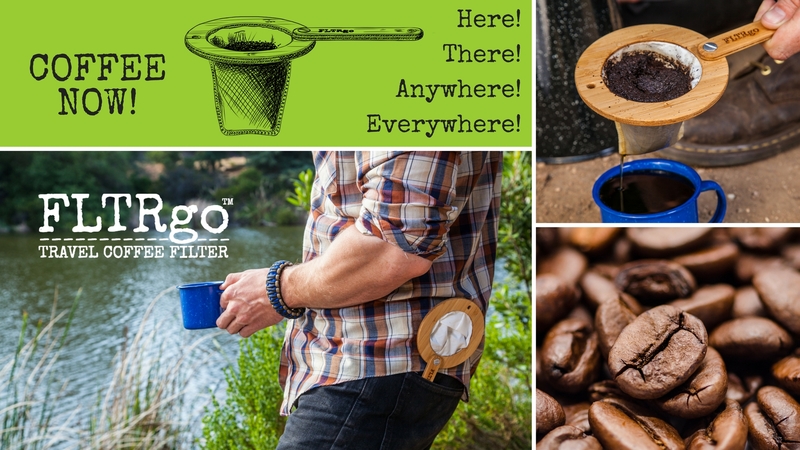 We realized that the Travel Coffee Filter Revolution was for everyone, everywhere, all the time! Join the revolution! Get your own FLTRgo now!